I would like to address the veterans to the map creators. Six months ago, I was translating all the scenarios for Carthage on this site. And found that still a lot of battles with this ancient country is missing. Alessandro Crespi proposed to apply to the veterans project. Maybe you'll agree to help. And someone will be interested to create such battles. With the permission of Alessandro I will then post a list of the battles that isn't found. Last edit: 1 year 1 week ago by LeonardoAngelo. The famous battle of Carthage. First Punic war. 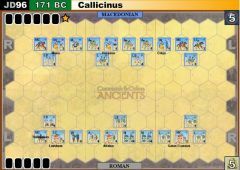 It's a battle between the Carthaginians and the Romans for the city of Multistrat (Ministrati, Mytistratus) acute Sicily during the First Punic war. 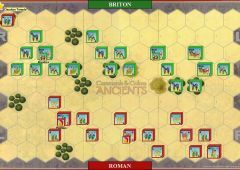 Parop battle (battle of Thermae) — a battle between the carthagians and the Romans during the first Punic war. In 260 BC, the Romans managed to defeat the Carthaginian fleet in the battle of the Miles. But between the Romans and their allies (the Greeks and the Italians of the coastal cities) were conflicts because of a dispute, to whom belongs the honor of the victory in the Mile, and consequently who owns the trophies and award. 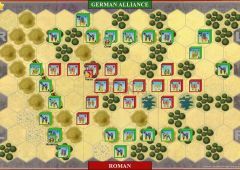 The feud led to the fact that the allies of the Romans pitched their camp at some distance from the Roman legionaries between Propom and Terms Gimersky. This was learned by the Carthaginian commander Hamilcar. Hamilcar arrived from Palermo, and attacked the Roman allies at the breakdown of those camps, and defeated them. Died of 4-6 thousand people. In honor of this victory, Hamilcar nicknamed Proboscis. Serge Lanelle. «Hannibal.» M. 2002. Last edit: 11 months 2 weeks ago by alecrespi. List of some famous battles of Carthage from the age of Punic wars Carthage (except battles with the Romans). 1-3) let's Start with the battles preceding the First Punic. 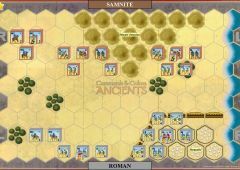 There are two scenarios with maps of battles in Messana (Rome vs Syracuse and Rome VS Carthage). And many people know that the first Punic began with the call of the mamertine from Messana. However, before mamertini called Rome for help - there were three battles. And only the first was attended Carthage with Syracuse against mamertina. In the second and third - only Syracuse vs mamertina. a) When the city Margane Hieron II defeated mamertines. Battles took place in the period - 269 or 268 BC. As reported by Diodorus, Hasdrubal Beautiful after the approval of the appointment (after the death of Hamilcar Barca) gathered an army (50-60 thousand infantry, 6-8 thousand horsemen, 200 elephants), defeated Orissa (oreton), capturing 12 towns, after which he married a Iberian Princess and founded New Carthage. Hasdrubal, the son-in-law of Hamilcar, as soon as he learned of the misfortune of his birth, destroyed the camp and headed For acre Levka; he had more than a hundred elephants with him. 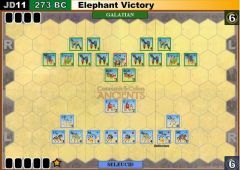 Proclaimed a strategist army and just as Carthaginian, he recruited an army of fifty thousand seasoned Marines and six thousand horsemen, along with two hundred elephants. First he went to war against king Orissa and killed everyone who was involved in the defeat of Hamilcar. Their twelve cities and all the cities of Iberia fell into his hands. After marrying the daughter of the Iberian Prince, he was proclaimed strategist in unlimited power by the entire people of Iberia. Following this, he founded the city on the coast and called it New Carthage; later, wanting to surpass Hamilcar, have founded another city. He brought in an army of sixty thousand infantry, eight thousand cavalry and two hundred elephants. 5) Kartala. 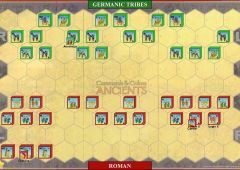 221 BC Hannibal against the Iberian tribes of the olcades. Before the war with Saguntum, Hannibal went camping in the land of olkalou Iberian people supposedly lived to the South of the Ebro, between the Tag (the Tagus river) and the ANAS (Guadiana). Alkadi though were within the dominion of the Carthaginians, the authorities did not recognize them. Taking attack rich in Kartal, the capital of olkalou (Polybius, the main city of olkalou, taken by Hannibal, calls Altea/Altea) and looting it, Hannibal had instilled so much fear into smaller tribes, which they agreed to pay tribute and accepted the Carthaginian citizenship — the rest of the city tribe, in fear, surrendered themselves to the Carthaginians. After that, they gathered tribute from the cities Hannibal took his troops with a rich booty to New Carthage into winter quarters, where generously divided between the warriors loot and paid them salaries for the past year. With the onset of spring 220g., Hannibal moved further afield, to the country of vakaev (Makeev) — tribe of Celtic origin, who lived in the valley of Doria (river Duero). Their main cities Germanicae (apparently, the modern Salamanca, Helmantica Hannibal took a sudden attack) and Arbeloa (modern Toro), Hannibal possessed the strength, and, of Arbocala (Arbakai) long defended her Hannibal possessed only attack after a long hard siege, as the city is large and populous, and its population defended themselves bravely. 7) the Siege and storming of Saguntum. Hannibal against the Greek colony of Saguntum. Sagunt was a Greek colony in Iberia, but also an ally of Rome. It was the capture of this city in 219-218 BC - served as a pretext for the beginning of the second Punic war. 8) Iberia. Carthage war with the tartessians. 215 BC the War with Cartesian — military actions were Gasdrubala against Cartesian Barca during the Second Punic war. 2) Titus Livius in his work mentions another invasion of Sicily by Carthage in 431 BC. 5) Third battle of Himera 406 BC Battle happened in the first war of Carthage with the Temples. 6) Capture Of Hippo By Carthage. (now Vibo Valentia), in southern Italy. The city belonged to at that time Syracuse was either their ally. In 343 BC Corinthian commander Timoleon (Timoleon, Timoleon) replaced the Syracuse tyrant Dionysius the Younger. Carthage army marched victoriously on the Eastern coast of Sicily and besieged Syracuse. Carthage managed to master the whole city, but they could not take the fortress. Began a long siege. However, the circumstances changed the situation in the opposite direction. Political strife broke out in Carthage itself, which affected the state of its army operating in Sicily. To top it all the siege troops were struck by plague. These two circumstances skillfully exploited commander Timoleon. He decisively repelled the enemy from Syracuse and, after receiving help from the Greek colonies in Sicily, he began to conduct successful offensive operations[. Carthage commander Gannon went back to Sicily, where Dionysius the younger challenged Hicket. The latter asked for Carthaginian help. Gannon led the army in Sicily in 345 BC] this year's Gannon with an army and a fleet of 150-200 ships moved to Sicily, taking with him 300 heavy chariots, more than 2 million riders, more than 2 million two-horse, apparently, lung, and chariots, and a variety of weapons, projectiles, and military vehicles, ogromny supply of food and other materials. Speaking primarily On Entella (Entella), Gannon devastated the countryside and blocked the people in the city. The campans, who occupied the city, turned for help to other cities that were hostile to Carthage. None of them answered, except for the city of Galeria. These men sent a thousand hoplites to them, but the carthagians intercepted them, broke them, and cut them all out. Gannon took the Entella, moved to Syracuse and took her to port, but was removed and replaced with McMahon. To help Syracuse from its Metropolitan of Corinth came the army, led by Timoleon. Gannon, who could not prevent the landing of troops Timoleon, was removed from command and recalled to Africa. Hamilcar, the Carthaginian commander in Sicily, having mastered the remaining outposts, again moved with his army against Syracuse, intending to take the city by storm. He prevented the importation of grain to the Syracuse, as he dominated the sea; destroyed crops in the country, taking it immediately after he seized the area around the Olympus, which is located in front of the city to the South, on the shore of a Large Harbour, near the mouth of the river Anapa. Immediately upon arrival to the city, he decided to attack the walls of Syracuse. But the townspeople, recognizing the intentions of the enemy, sent by night about three thousand infantry and about four hundred horsemen, and ordered them to take Evreli the narrow entrance in the Western part of the plateau Epipole, which lies above the town to the West and overlooking the valley of the ANAP. Hamilcar led those who always fought beside him, followed defector Deinocrates assigned to the cavalry. The bulk of the infantry was divided into two phalanges, one consisting of the Carthaginian and the other of the Greek allies. Meanwhile, the army began the confusion because of the narrowness and obstruction of the roads, as well as the darkness (it was night). 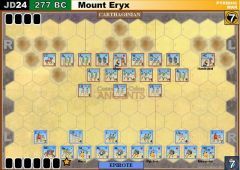 At this point, the Syracuse, who occupied Eurorail, saw that the carthagians were moving in disarray, while they themselves held a higher position, attacked the enemy. They also fired the Carthaginians from the heights. The Carthaginians were put to flight. But since the terrain was not wide passage, some of them were trampled by their own riders, others fought among themselves, as if the enemies, due to darkness. Hamilcar at first steadfastly restrained the enemy and urged those standing next to him to support him in battle; but when the soldiers left him because of confusion and panic, and he was left alone, he was fiercely attacked by the syracusans. Hamilcar was captured. In Syracuse, he was tortured and his head was severed. Thus the siege army of the Carthaginians broke Antant, brother Agatocle. Moreover, the commander of the Carthaginian Hamilcar died. The remnants of the Carthaginian army soon gathered and chose the commander over the Greeks of Deinocrates, and the Carthaginians gave the authorities those who were second in importance after Hamilcar. Meanwhile, the island began a revolt against Carthage led by Akragas (second war of Carthage with Temples), and then the sea battle at Megara, won by the Carthaginians. "The first people of Enna introduced them to your city Acragantum. When argantine released Enna, then went to ARBES, despite standing in the city garrison. 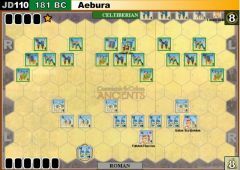 After a fierce battle, in which citizens Arbesa helped Acragantum, the garrison was captured and, although many of the Carthaginians were killed, at least 500 of them surrendered at once." Soon, Agathocles decided to declare himself king. After that, he decided to attack the ancient Phoenician colony, a longtime ally of Carthage — the city of Utica. Utica at one time joined Agatocle, but now he had fallen away from him. Having made a sudden attack on Utica and captured 300 citizens who were caught in the suburbs, Agafokl first offered a pardon and demanded to hand over the city, but when the citizens refused, he built a siege machine (probably moving towers, as "gelepol"), brought prisoners to her, and took her to the walls. But it did not shake the desire of utilized to protect the city. 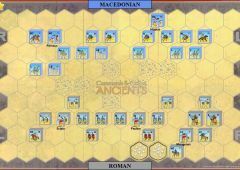 Agathocles, posted by car catapults, slingers, and archers began to attack. Residents of the city in response also used throwing weapons despite the fact that the enemy used a human shield from their compatriots. When Agathocles saw that the inhabitants of Utica intend to fight, he built his army in a position to storm from all sides and, in spite of the points where the walls were badly folded, broke into the city. Agathocles massacred and plundered the city. After he left a garrison in the city. Arahat left Alaflam to command the army in Africa, initially had some success by sending in the inner region of Libya part of the army under the command Almaha. The computers have taken big city Tokey, then conquered many nomads, who lived nearby. Then he captured the city Fellini and subjugated the neighbouring areas, the so-called espadanedo. Then the Computers took over the city Meshalo. He also captured Hippocrates (not the one that took Agathocles). The computers captured the free city of Akris, which he gave to the soldiers to plunder after he had enslaved the people. Gaining a lot of trophies, Computers, back to Arigato. The latter sent his army back to the interior of Libya. However, the city Miltini, Computers was defeated in street battles. The computers then went through the high ridge, a distance of about 200 steps (about 23 miles) and approached the area Pithecusa, where the possession of three cities — one assault, the other two conviction. However, learning of the approach of enemy forces, retreated to Computers Arigatou. After these events, the Senate of Carthage held a meeting and the senators decided to create three armies and send: one against the cities on the coast, the second — in the Central region, and the third — in the interior of the country. They hoped to lift the siege and provide the city with food, which was not enough as Carthage had a lot of refugees because of the war. When 30,000 Carthage soldiers were sent out of the city, the people who remained as a garrison were only enough to protect themselves, but because of their wealth they enjoyed everything in abundance, and the allies who so far, because of their fear of the Greeks, were forced to conclude a Treaty with him, again found courage and hurried back to the earlier Alliance with Carthage. When Arahat saw that the whole of Libya is occupied by the Carthaginian army, he also divided his army, part he sent in a coastal area of the remaining forces, he gave part of it Ashreinu and sent him forward, and the part he took himself, leaving a garrison in Tunis. Hanno, who commanded the army in the Central region, ambushed Ashiana and suddenly attacked him, killing more than 4 thousand soldiers and about 200 horse, among whom was the commander himself, Ashion; among the other Greeks, some were captured, some escape, fled to Arigato, which was at a distance of about 500 stages (about 57 miles). At the same time Himilco, who was appointed to lead the campaign in the interior region, ambushed Imaha, Arahat commander, led his army, heavily encumbered with booty of the previously captured cities. When the Greeks pulled their forces and challenged him to a fight, Himilco left part of his army under arms town, giving them orders that when he would retreat to a feigned flight, they should pounce on the pursuers. He brought half his men and taking the fight on short distance from the camp immediately fled as if in panic. Soldiers Imaha delighted with his victory and generally not thinking about the preservation of order, in disorder pursued the retreating, but when suddenly from another part of the city came forward a second Carthaginian army, fully prepared for combat and when a large army shouted in unison, the Greeks panicked. The carthagians rushed at the Greeks, who were turned into a mess and frightened by a sudden attack. As a result, the Greeks were defeated. As the Carthaginians cut off the escape routes of the enemy in his camp, the EVM was forced to retreat to the nearest hill, which was poorly provided with water. When the carthagians surrounded the place, the Greeks, who became weak from thirst and gave way to the enemy, almost all were killed. In fact, of the 8,000 Marines, only 30 survived, and 840 riders fled the battlefield. 20) the Battle of Panorm (present. Palermo.) War of Carthage against Pyrrhus. Placing the Eryx garrison, Pierre went to the town of Iete (Iaetia), exceptionally strong, favorably located for the attack of Palermo. People Iete surrendered on their own, after which Pierre went immediately to the city of Palermo, which has the finest harbour in all Sicily. Of Palermo, he also took by storm. When Pierre got control of the fortress Gerty (Herctae), then took all the possessions of Carthage in Sicily, except Lilibet. Thus, Pyrrhus conquered almost the whole of Sicily, except Lilibet. List of wars not covered by the scenarios. Information on them is not much, but maybe someone will be interested. The conquest by the Carthaginians of Sardinia — a series of wars in 4 to 6 century BC, who led Carthage to seize Sardinia in the Mediterranean sea. War of Carthage with Massalia — war Greek colony, founded Massalia (Marseille) and settled in Corsica, and Carthage. In fact, this war of Carthage with foceis. The revolt of the Numidians — the war between numidinae and the Carthaginians, begun to around 256 BC during the First Punic war. The war that occurred between the Second and Third Punic Wars. The famous battle of Carthage. Second Punic war. 1) The first battle at Placentia winter of 218-217 BC. The battle of Placentia — the battle in the Second Punic war. After the battle of Trebbia, the Romans went to the winter apartments in Placentia. But the Carthaginians not easily given to winter Romans: the country reiderstvo Numidian horsemen, celtiberia and laitance from the army of Carthage. The Romans were thus cut off from resupply of food, excluding only that which delivered them to the ships on the river, which was built near a Placentia shopping Marina, surrounded by strong fortifications and a numerous garrison guarded. Hoping to take this castle Marina power Hannibal Barca made, taking with him the cavalry and light infantry, and unexpectedly attacked her in the night. However, Hannibal failed to deceive the guards, was raised a cry that was heard in Placentia. Thus at dawn was Consul Publius Cornelius Scipio (Tiberius Sempronii long at that time was in Rome) with the cavalry and legions. Even before the arrival of their Legion, both cavalry fought, and since Hannibal, having received the wound, was forced to leave the battle, the carthagians fell in spirit and the Roman troops were saved. The battle and Siege Victual is a battle in the Second Punic war. Hannibal Barca began the siege of Victual before the battle of Titina, but because the battle ended the siege. Countryside Victual served (since the war with the Gauls in 223 BC) the Romans granary; then, as it was fortified, there began to flock from all sides surrounding inhabitants belonging to different tribes; at the same time fear of devastation forced many peasants to settle there. After an unsuccessful attempt to seize the pier at Placentia, in which Hannibal was wounded, the Carthaginian commander-in-chief, a few days after the wound healed, quickly moved to Victumul to seize them with an attack. Residents Victual, upon learning of the victory of the Romans under Placentia, cheered, inspired by the courage, took up arms and went out to meet Hannibal. The armies of the Carthaginians and the Romans from Victual met on the road in marching rather than in order of battle. Hannibal defeated the Romans, 35 thousand people were put to flight in a relatively small army of Carthaginians. The next day, the city Victual gave up and took in the walls of the Carthaginian detachment. Citizens were told to give out the weapon; but as soon as citizens obeyed, there was a signal to plunder the city. 3) the Second battle near Placentia. 217 BC. The siege of Spillover-a battle during the second Punic war. After the defeat of the Romans at the battle in Umbria Carthaginian military commander Hannibal Barca from Umbria "came the straight path" to Spoleti, a town in South Umbria on Flaminias the road. Hannibal, devastated the neighborhood, besieged the city of Spoletium, but was discarded in the battle with great losses. This unfortunate battle led him to think of the impossibility for his army to take Rome by storm. Hannibal of Spoletium turned into the Pizen region, located in Central Italy South of Ancona, adjacent to the Adriatic sea. 7) the First battle of Nola 216 BC. 8) the battle of Kumah 215 BC. 9) the Battle of Intbilisi 215 BC. - as it turned out, I was wrong, there is such a map, and from the Borg. I started to develop it until I came across a job as a master. Therefore, this scenario is crossed off the list. Last edit: 10 months 3 days ago by LeonardoAngelo.